Brian Davis represents Division 3 of Madera Irrigation District. Brian is a 4th generation California farmer born and raised in the Ripperdan area of Madera County. Brian attended Madera High School, where he was active in the Future Farmers of America (FFA) organization. Brian then attended Cal Poly, San Luis Obispo, where he earned FFA’s distinguished American Farmer Award, and later graduated with a B.S. in Agribusiness and a B.S. in Wine & Viticulture. Brian began working in his family’s farming operation after college managing its day to day operations. In 2009, Brian and his brother started a small wine company where they marketed and distributed pomegranate wines throughout the Central Valley. In 2010, he sat on the Madera Chamber of Commerce’s Tourism Alliance Committee and helped to plan and organize Madera’s first Pomegranate Festival. Brian later served as a Director on the Madera Chamber of Commerce’s Board. Brian has participated in both the Almond Board of California and Blue Diamond Growers leadership programs. In addition to his involvement in Madera based organizations, Brian also serves as a Director on the Association of California Water Agencies (ACWA) Region 6 Board. 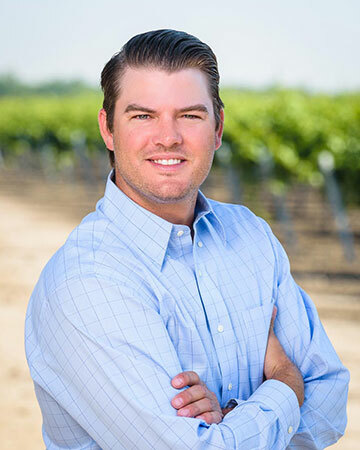 Brian’s passion lies in helping the public understand and recognize the presence of ag in their daily lives and strives to market California agriculture locally, nationally and globally. Brian was appointed to the MID Board of Directors in 2014.